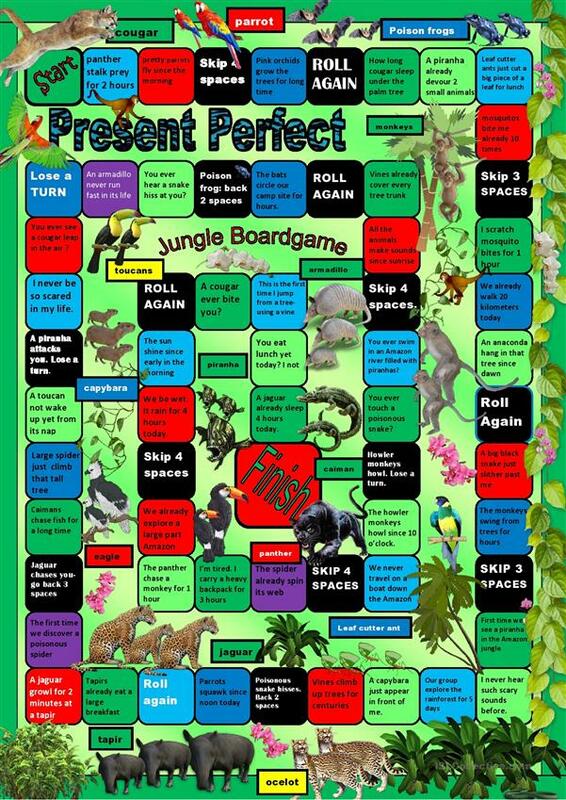 Practice the present perfect tense while visiting the Amazon jungle. Learn the names of the plants and animals. Most hints are for affirmative sentences. Make negatives and questions using the same hints. Thanks to PhilipR for the template. This downloadable handout was created for high school students, elementary school students and students with special educational needs, learning difficulties, e.g. dyslexia at Pre-intermediate (A2) and Intermediate (B1) level. It is valuable for consolidating Present perfect tenses in English, and is excellent for honing your students' Speaking skills. It centers around the vocabulary topic of Actions, Animals, Places and Tourism.